Northern Vegans Presents What The Health! FREE tickets online at https://www.tugg.com/e…/what-the-health-movie-screening-0nve or locally at City Green Market in the Old Bank Building (Negaunee), Marquette Food Co-op (Marquette), and Marquette Cinemas (Thomas Theater) in Marquette while supplies last. $10.00 admission at the door. Additional donations are welcome and appreciated the evening of the event. 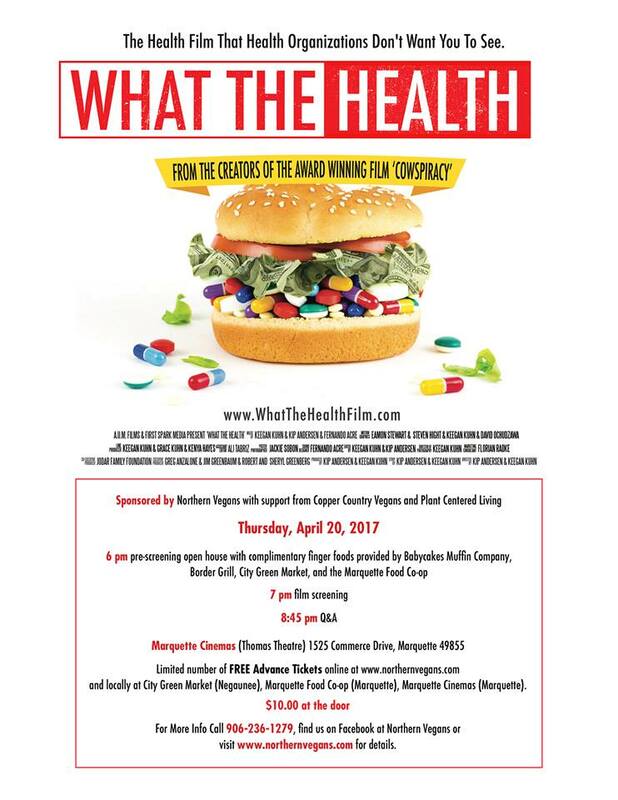 Please join Northern Vegans for an exclusive one night only screening of the film What the Health: The Health Film That Health Organizations Don’t Want You To See. This is the second film from the creators of the award winning documentary “Cowspiracy.” The film exposes the collusion and corruption in government and big business that is costing us trillions of healthcare dollars, and keeping us sick. Be sure to arrive early to enjoy complimentary vegan finger foods and plan to stay after the film for a lively question and answer session facilitated by Northern Vegans. Pre-screening open house starts at 6 pm with the screening to follow at 7 pm. Call 906-236-1279, find us on Facebook at Northern Vegans, or visit www.northernvegans.com for details. Food and refreshments graciously donated by Babycakes Muffin Company, Border Grill, City Green Market, and Marquette Food Co-op.